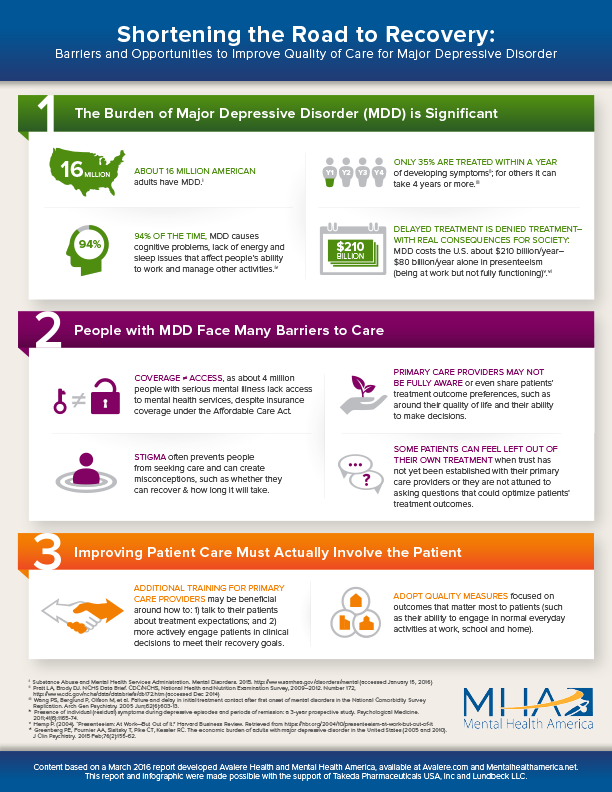 Published in March by Mental Health America (MHA) and Avalere Health, a paper and infographic entitled Shortening the Road to Recovery for People with Major Depressive Disorder (MDD) found that people with MDD continue to face significant barriers to care. The data revealed that insurance coverage does not necessarily lead to access, and patients often feel left out of their own treatment. While providing support for the development of this research, I was (and still am) struggling with my depression. My work was a constant reminder that I—a mental health advocate—needed to stop and acknowledge the signs screaming at me from my mind and body. Dealing with depression is hard. It’s slow, it sneaks up on you. And while it’s sneaking up, you’re hoping it’s not really happening. You postpone treatment, thinking maybe it will go away. You say, “Maybe it’s just life, the new baby, lack of sleep … or stress.” It gets worse and eventually it’s overwhelming you. Sleeping, crying, angry outbursts, TV, food, and alcohol become your best friends—all while you push away from your actual friends. It’s too hard to think straight or find the motivation to get help. Then when you do muster up the energy, courage, or ability to reach out, it’s hard to find the help you need. You call. People are booked. Waiting lists are long. The therapist you were referred to doesn’t take your insurance. Trying to find the right medication takes time. You feel guilty about unloading on those around you, or think you shouldn’t complain at all because your problems aren’t as bad as you know they could be. And really, in the end, all you want is to be alone. So while the paper solidifies important policy and practice issues that will improve care for people with depression, it’s crucial to understand how this plays out on the individual level and how personal the experience really is. Shortening the road to recovery. I wish it was easier to find a mental health provider who would listen and help me explore all my treatment options. I have health insurance but couldn’t access the therapist and treatment best suited for me. I’ve worked with people who don’t have insurance, transportation, or a job. I know that for them, facing these barriers means having access to no treatment at all. This bout of depression has shown me how access to care issues continue to translate into delayed care—even for someone like me who understands the system and successfully accessed care before. Getting help is about timing and meeting the right people who help turn the struggle around. It’s about removing the shame and discrimination associated with mental illness so that individuals don’t hesitate to speak up when they’re suffering. And it’s about creating a behavioral health system that is accommodating when people do reach out. There’s a lot we can do as individuals and especially as a society to make sure people get the care they need when they need it. This is an epidemic that affects millions of people, and we must make it easier to access treatment. I deeply appreciated the experience of working on the research because it forced me to take a look at the one thing I wanted to ignore: my depression. The paper was one of a lot of little things in my life nudging me to make better decisions about my mental health. Taking that first step seems easy enough when I’m talking about it on paper — but in reality, it isn’t easy at all. Even so, reaching out certainly seems necessary. And in these moments, I’m grateful for the people and little life signs that continue to point me in the right direction. If there’s one thing I’ve learned, it’s that I have to be proactive when it comes to seeking care, and keep fighting for a system that makes it easier for millions of people like me to get the help they need. Theresa Nguyen is the Senior Director of Policy and Programming for Mental Health America. Theresa supports MHA’s policy efforts and manages various programs including MHA Screening, The State of Mental Health in America, and Workplace Wellness. 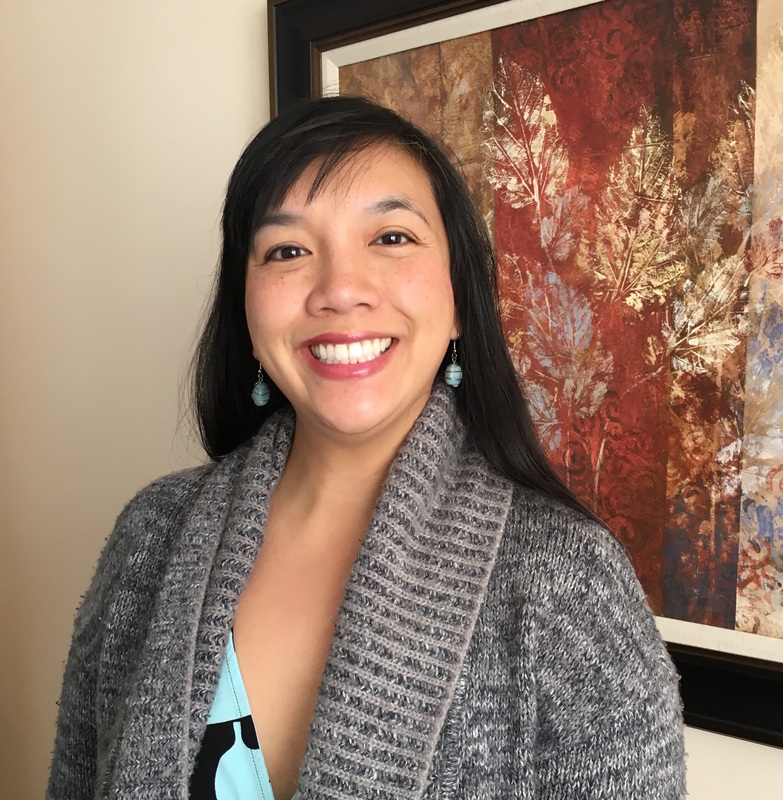 As a licensed clinical social worker, she has over 11 years of experience in mental health as a clinician, educator and advocate. Her clinical experience focused on working with children and adults with serious mental illness, homelessness, dual diagnosis treatment, and early intervention of psychosis. As an advocate she worked to build a consumer based mental health workforce, to improve access to treatment through community based and recovery oriented mental health programs, and to address needs of underserved communities. She was an adjunct professor in California and North Carolina teaching Mental Health Recovery, Psychosocial Rehabilitation and Social Welfare Policy. Prior to joining MHA National, Theresa worked at both MHALA (Los Angeles, CA) and MHAOC (Orange County, CA).